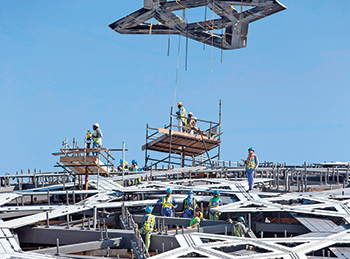 The work on the cladding of the Louvre Abu Dhabi dome is well under way, revealed Tourism Development and Investment Company (TDIC), the master developer of Saadiyat’s Cultural District. The dome cladding which is made up of eight different layers – four internal and four external – is one of the most significant stages of the museum’s construction, giving Louvre Abu Dhabi its final shape and look as well as the museum’s interior ‘rain of light’ effect, it said. To date, 30 per cent of the cladding has been completed, with full installation expected by June of this year, TDIC said. The design of the cladding of the dome, which is the museum’s main feature, is inspired by the interlaced palm leaves traditionally used as roofing material in the Emirates. The roof’s complex pattern is the result of a highly studied geometric design, repeated at various sizes and angles in eight different layers, giving the dome a delicate form that leads to a magnificent ‘rain of light’ effect. The cladding layers are made from 7,850 star-shaped aluminium and stainless steel elements, the largest of which measures 13 m in diameter and weighs 1.3 tonnes. These star-shaped elements make up eight layers of cladding weighing a total of 2,000 tonnes. The 7,000-tonne dome, which was constructed over the span of 10 months, was originally built on top of 120 temporary towers as a way to support its weight during the construction process. It was recently lifted atop its final position supported by only four concrete piers in a first-of-its-kind technique in the world of construction for a permanent structure of this scale and size. All of the museum’s structures have been completed with work on the internal finishing progressing. As of early March, more than 24 million man hours have been completed on the project.